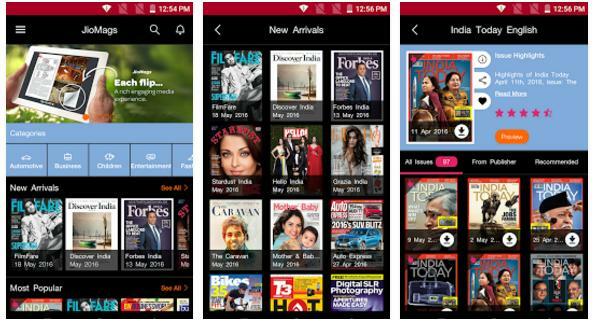 The JioMags application is the No.1 Magazine app in India with the most Premium and Popular Magazines. The app makes user a personal library and read from more than 500 titles with their 15+ categories. The application has smart features those are use to always more to read. The application has available in four major Indian regional languages are Hindi, Marathi, Gujarati and Tamil. User can select Language preference from Settings and read in own language. Read select articles from various magazines and adjust the text according to your screen size. Choose from local magazines in 10 different languages. The application has Fantastic Reading Features like Annotate, Bookmark and Highlight inside the reader and also use Text-to-speech feature to let the magazines read out to you. User can play Live the stories and watch Videos along with articles. The application has 15+ Categories, user can choose from News and Education, Entertainment, Health or Sports and many more.